From creamy split pea soup to healthy gazpacho, here are seven ways to use fennel in soup. Fresh fennel bulbs and the plant's herbaceous fronds are terrific in all kinds of spring dishes. From creamy split pea soup to healthy gazpacho, here are seven ways to use fennel in soup. Tender, lightly caramelized fennel stars in this velvety soup. This refreshing soup gets delicious tang thanks to a swirl of crème fraîche. 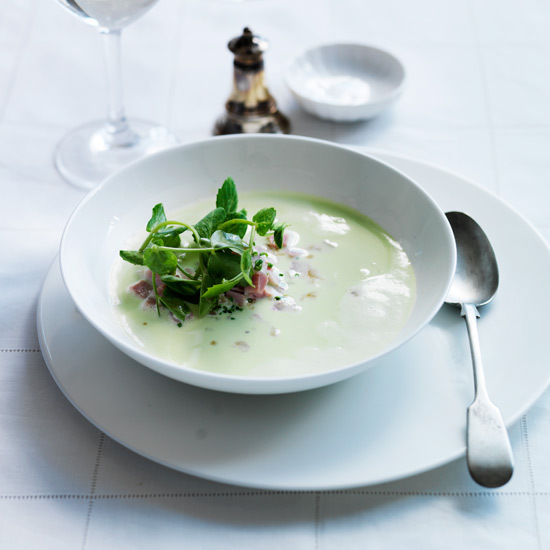 Serve this fast soup with a sprinkle of chopped fennel tops. Citrus oil is used two ways in this tasty soup: for sautéing the fennel and as a garnish. Fennel adds vibrant flavor to this excellent take on split pea soup. This healthy, vegetarian soup is perfect for a warm spring day. "Fennel might be my favorite vegetable," says chef Nicolaus Balla, who blends it into his supersavory version of the traditional Hungarian soup.